ThiThis Grip Pen is a comfort grip pen that doubles as a flash drive. Features LED indicator and comes in black or silver color. 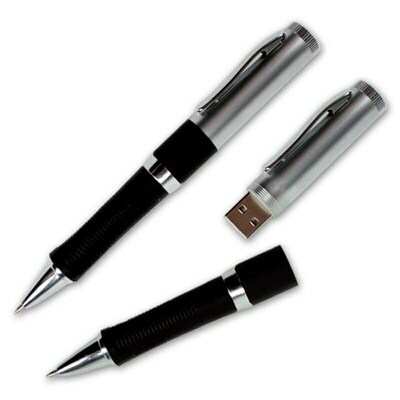 Not just a novelty item to store your data, it actually works very well as both a writing instrument and a promotional USB drive! It’s ideal for corporate and professional applications. Due to its useful and classy nature, it is also suitable for less formal environments. Either way, it’s an excellent choice for advertising and promotion. Everyone loves a dual functioning product. The Grip Pen is a favorite marketing tool for businesses looking to expand and brand at the same time. Featuring fully functional ball point pen and ink with working light LED indicator, the casing unscrews to reveal a port for discrete data storage. Customers aren’t going to throw away such a high value gift, thus ensuring your logo is around for years to come. Silkscreen printing or laser engraving options are available to give your gift a truly customizable feel.